Look, we all know the deal. When it comes to betting on sports, for all those who do not live in Nevada, using some of the best USA online sportsbooks are the way to go. They’re safe, legal, and most of all convenient so that everyone in the US can place a bet. Still, Vegas is Vegas for a reason. Whether you consider yourself a casual bettor or a true expert, you’re going to want to make a trip to Vegas at some point. That’s why we compiled this list of the top 10 sportsbook in Las Vegas. We tried our best to avoid the obvious tourist traps, (although you’ll find a couple of the usual suspects on our list that were just too good to turn away) and stick to the places the Vegas natives visit when they want to place a bet. When you’re visiting the strip or out for a night on the town, any of these fine establishments should meet your greatest expectations. There are hundreds of places to place a bet on a game in Vegas, how did we narrow it down to so few? Here are some characteristics that we looked for: we wanted somewhere comfortable, but we didn’t want a sports bar. Not that sports bars don’t have their place, but we don’t want our environment to detract too much from the betting. In addition, we want top tier technology that makes following along with the games and our bets easy as can be. Atmosphere can also count for a lot. If we’re going to spend some time in a land based sportsbook placing bets and following along with the games, we want to do it in a place we feel comfortable, and a place we wouldn’t feel ashamed to bring our friends. Of course, we also want great odds, a lot of betting lines, and high, high limits. All the sportsbooks on this list check all these qualities off and then some. 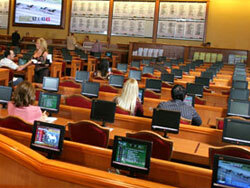 One more characteristic we took into consideration was the advent of mobile betting in Las Vegas. For a long time, land based sportsbooks served Nevada residents so long as they signed up in person and could prove their residency. Now, with the advent of modern technology and GPS in every smart phone, these programs are allowing visitors to sign up for mobile betting and place a bet from anywhere within the city. 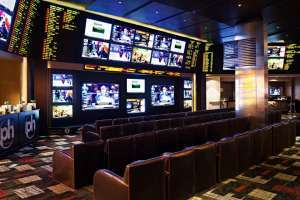 Whether you’re in the lounge of your favorite sportsbook or living it up elsewhere in the city, you don’t have to miss a bet at any of the top Vegas sportsbooks that offer mobile betting. While visitors still need to visit the counter to cash out, these mobile apps can save players many unnecessary trips to the counter, and allow them to multitask as much as possible in a city designed to have an exciting game or event on every block. 10. Planet Hollywood Las Vegas - We know, we know, Planet Hollywood? Please hear us out. We dig this sportsbook because of its unique vibe. There’s not a more casual environment for betting on sports in all of Vegas, and if you’ve been out in the desert of sin city too long, the relaxing lounge with its mahogany chairs and plush seating just may be the oasis you need. The VIP race lounge doesn’t hurt, either. 9. Red Rock - If you came to Vegas for the social betting scene, you won’t find a better venue for it than the sports and racebook inside the Red Rock hotel and casino. Catering to a more specialized betting crowd and featuring diverse betting lines from NASCAR all the way to MMA fights, sports fans of all walks will find an excellent home at the Red Rock Casino. If you're in Vegas, don't miss this sports betting experience. 8. South Point - This treasure lies just off the beaten path of the Vegas strip, and has a very “Old Vegas” feel to it. 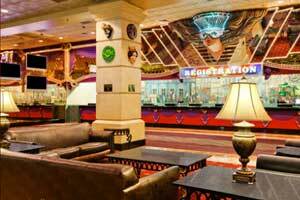 They offer all the standard betting lines a player could be interested in and a lounge that feels more like an extended family room than a crowded sports bar. It’s also secluded from the noise of the casino floor and the poker room, which is a nice benefit. South Point was one of the first Vegas sportsbooks to offer mobile betting to visitors, which is great because the hotel is as reasonably priced as you’ll find for the location and available amenities. South Point is a great place to relax and bet with from anywhere in the city. 7. Wynn - No trip to Vegas is complete without a visit to the Wynn. If you crave a visit to the Las Vegas that Frank Sinatra and the rest of the rat pack visited, this is your place. The lounge has an executive feel that drips class and several leather chairs. 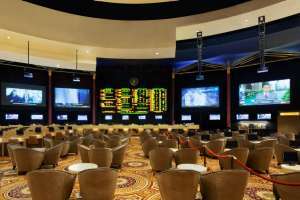 Although the lobby tends to cater more to race fans than some other sportsbooks, each seat comes equipped with its own personal screen, so following along with the game of your choice shouldn’t be an issue. 6. MGM Grand - Cons: This is probably one of the biggest tourist stops for every Vegas newbie, no matter their dedication to betting or any other forms of casino gaming. Pros: It’s that way for a reason. No sportsbook offers the service and grand spectacle of the MGM grand. 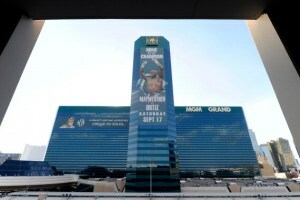 Conveniently located in the middle of the strip and boasting skyboxes for its high rolling players, every bettor in the grand gets to feel like a VIP. Now that the Grand even offers mobile betting, watch out. 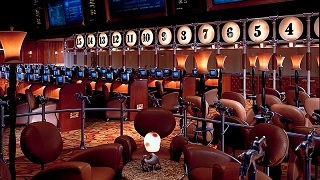 You don’t even have to leave the comfort of your chair or the splendor of its 30 screens to place a bet. 5. Mandalay Bay - Let’s put it bluntly, we love Mandalay Bay. If we lived in Vegas full time, we would be here every day. Boasting a 28x30 foot projection screen for the big game along with 38 other TVs, you won’t miss a second of action. Their full service bar, deli, and top notch betting counter provides excellent service to everyone ranging from homeless to high roller. Those in search of a quality betting experience should find a good home in Mandalay Bay. 4. The Bellagio - Some Vegas visitors are offended by special treatment for high rollers. This is not the place for them. While the whole sportsbook exudes luxury and all range of players get excellent service and access to plush, leather commander chairs, those who test the $10,000 single bet limits are given access to a whole new plateau of luxury and executive treatment. It may not be the place to spend a quiet Sunday afternoon, but the Bellagio is an essential Las Vegas experience. 3. Orleans Hotel and Casino - Sometimes when you’re in Vegas you need to get somewhere with a distinct non-Vegas feel. The sportsbook in the Orleans hotel and casino delivers all the punch and fun of a Mardi Gras party in their comfortable, accessible lobby that seats up to 150. The real treasure at the Orleans happens for Monday Night Football and March Madness, when their epic parties set the whole strip aflame. There is no better way to celebrate a winning bet! 2. Caesar’s Palace - Yes, Caesar’s Palace is another tourist trap, but again, it has that status for a reason. No sportsbook offers the variety of pick ‘em parlay cards as they do in the palace, and the lounge to keep track of the games in offers the best combination of modern amenities and old school comfort you’ll find. The bikini clad servers are by no stretch of the imagination a bad thing, nor is the ability for guests to place bets with their mobile phones right from the lobby or anywhere in the city. Most know Caesar’s for decadence, and the sportsbook is no exception. Just ask the “Las Vegas Review” who have ranked this sportsbook top of the town for four years running. 1. The Mirage - When it comes to our pick for the most essential sports betting experience, the Mirage has it hands down. Even though they don’t offer mobile betting, a personal betting terminal at every seat ensures that you’ll never miss an opportunity and that you won’t have to wait in line. 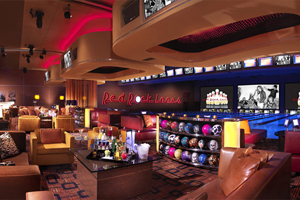 It also means you can order food and drinks from your seat while enjoying one of the biggest lobbies in all of Vegas. All the personal screens and big screens lining the walls mean you won’t miss a second of action, and the highest betting limits in all of Vegas means you won’t miss an opportunity to max out on profits. 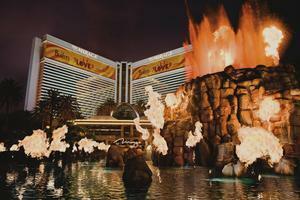 The Mirage is the place to go for serious and casual bettors when they want to see what the New Vegas is all about. 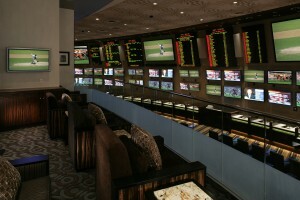 So, you have our opinion on the best sportsbooks in Vegas, but how do you pick which one is right for you? Truthfully, you can’t go wrong at any of these establishments when it comes to service and availability of the products. 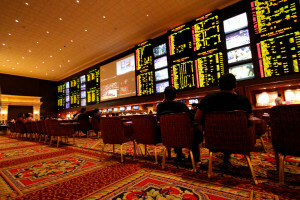 The best way to choose which sportsbook is right for you is by shopping the odds. If you have a particular bet you want to make, check around to see where you can get the best payout. All of these sportsbooks should have websites where you can track the odds, and even if you can’t place the bet directly from your mobile device at the time, you can at least get a good sense of which sportsbooks will offer the best bet. At the end of the day, Vegas is all about the experience. Don’t be afraid to venture away from any lists of top 10 sportsbooks in Las Vegas and explore away from the beaten path. There are hidden gems abound in sin city!